December 15 protest against violence in Belgrade, Serbia. Photo by Vesna Radojević , used with permission. Protests under the slogan “Stop to Bloody Shirts” continued in Belgrade on December 15, with an estimated 20,000 people demanding that the Serbian government stop the verbal and physical violence against its critics. The event organized by opposition parties mirrored the first protest against violence  that took place a week earlier, prompted by a recent attack on a government critic  whose shirt was literally bloodied after he was assaulted by pro-government thugs. But this time, almost twice as many people peacefully marched through the center of the capital, galvanized by several events that took place during the previous week. On the night of December 11, unknown perpetrators tried to assassinate the seasoned journalist Milan Jovanović in the municipality of Grocka, on the outskirts of Belgrade. Attackers first threw Molotov cocktails at his house, and then opened fire at his front door, attempting to trap Jovanović and his family inside. Jovanović is nearly 70 and has a medical condition. Jovanović and his wife escaped through a rear window while their property perished in the flames. Neighbors managed to get them to a hospital, and out of harm's way. Jovanović had been receiving threats because of his coverage of local corruption cases, but authorities did nothing to intervene. “I won't stop writing about the thieves, even if they kill me,” Milan Jovanović stated  right after the attack. Sigurno. Jedan probao pa mu zapalise kuću. Sure. A guy tried that, and his house burned down. Foundation Slavko Ćuruvuja, named in honor of a critical journalist murdered in 1999 , initiated a crowdfunding drive  to help the Jovanović family, starting with medical equipment for him and basic necessities, such as food and clothing. Pozivamo građane i NVO da uplatom dobrotvornog priloga što pre skupimo bar 100.000 dinara za najhitniju pomoć Milanu Jovanoviću, novinaru portala Žig info, kome su u noći između utorka i srede na kuću bačeni molotovljevi kokteli. We call upon the citizens and NGOs to donate so we can gather at least 100,000 dinars (around 950 dollars) for the most urgent aid to Milan Jovanović, a journalist of the portal Žig info, whose house was targeted by Molotov cocktails in the night between Tuesday and Wednesday. Spread the word! Many citizens reacted promptly, while sharing the call for a new protest. So far, the campaign has collected the equivalent of nearly USD $13,000. Many perceived a direct connection between the atmosphere of enabling violence by the government, the president's response, and the attack in Grocka. At the protest held last Saturday, citizens demanded an end to the violence. The President of the Republic said he won't meet the demands even if 5 million people gather. Some people understood his message in this way. Quoted tweet with video: Attempted murder of journalist Milan Jovanović. People expressed support for the protest using the slogan “I'm one of the five million” (hashtag #1od5miliona ) in direct reference to the president's remark. Serbia has about six million residents. 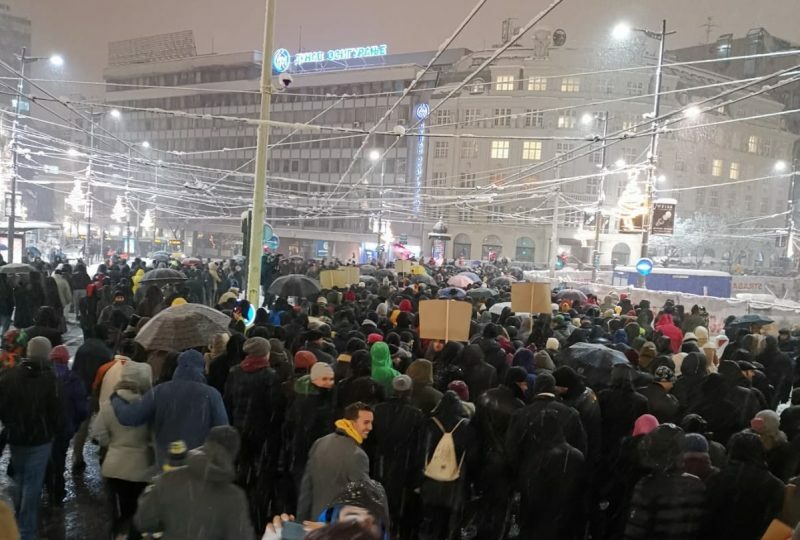 After the demonstration, many protesters and their supporters shared an aerial photo of the protest on the snowy night, illuminated by the holiday lights on the city streets. The next protest is scheduled for next Saturday, December 22.